WHO IS INNOCENT IN ISLAM? Muslims defensive stand use a Quranic verse which say: he that kills an innocent person is as though he kills the whole of mankind as a reason to say, they don’t kill innocent people. The question is, to what context–or extent explains to us who are indeed innocent? Are they non-combatant ordinary civilians indeed or are they the ones presumed only by the leader as innocent? In this article, I will tackle the reasons why I believe innocent people in Islam are those possibly guilty people yet the leader presumed as innocent. Likewise, the guilty people deserving of death are those possibly innocent people presumed guilty by the leader. In his war dealings, Muhammad did a violation against Allah by doing murder and yet Allah proclaimed him a pattern of conduct. Therefore Islamic practice in war dealings includes murder such as exemplified by Muhammad when he massacred Banu Quraisha through a jew’s verdict which is against Quranic principle as this action is not divinely sanctioned–its missing from the Quran! Muhammad massacred a tribe according to the judgment of a Jew. Including teens with pubic hairs as guilty of death and spared those without pubic hair as innocent. The scenario is like this: Muhammad requested the participation of the jews for the judgment of their prisoners of war, Banu Quraisha. Saad, the leader of the tribe, made a verdict of death penalty which Muhammad has approval thus Muhammad ordered Banu Quraisha (including teens with pubic hair) to be executed. The question is: how did muhammad know who are innocent indeed from not? In other words, how did he determine penal responsibility of these enemies of war? “Penal responsibility, or criminal responsibility, refers to a person’s ability to understand when the crime was committed. A person is responsible and could go to jail having fully known at the time of the crime what they did, and that they understood the implications. In short, penal responsibility is the mental condition of an offender to know that his actions are morally right or wrong. A state of mind wherein his age of reason is developed to determine criminal liability. Regarding Banu Quraisha, How did Muhammad established penal responsibility of his prisoners in such a manner that convicted them for death penalty? In order to establish penal responsibility, there must need the necessity to determine mental age. Bec mental age is determinant of penal responsibility. Lets say, a mental age of 13years old is liable of penal responsibility, then it must be established first that the offender has the appropriate mental age. If its pubic hairs that determines who are liable for penal responsibility, then probably 13year olds, as the growth of pubic hairs begins, are liable for penal responsibility. What if among these prisoners were people that are mentally backwards, say, a 13year old having a mental age of 10? Killing them without establishing mental age is prone to killing mentally backwards people, which are logically innocent as they dont have yet penal responsibility. So did Muhammad made a psychological investigation to determine mental age? No. Bec it is not in the Quran to determine mental age or to particularly, establish penal responsibility, therefore Muhammad killing prisoners of war is founded on no other basis but presumption. He presumed who are guilty to be killed and who are innocent to be spared bec of the fact that he was unable to establish penal responsibility–or even, for the sake of justice, mental age. So who are innocent in Islam? Those possibly guilty people as they could be 10year olds but having mentally advance mind of 13, guilty of treason and breaking treaties, yet still, Muhammad spared them from death bec he presumed them innocent by his inability to establish penal responsibility. So who are guilty of death? Those possibly innocent people, mentally backwards, yet killed bec simply, they have pubic hairs. 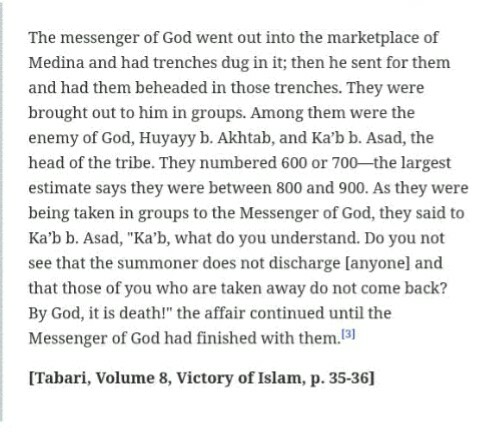 Muhammad killed them bec he presumed them guilty by his inability to establish penal responsibility. Therefore presumption of guilt and presumption of innocence is primarily an active reason in islam to kill or spare. So who are innocent? Those presumed innocent by the leader. So who are guilty? Those presumed guilty by the leader. Such that when Islam is at war, for example, against America and the leader presumed the guilt of ordinary citizens as allies of its government by being taxpayers wherein their taxes help America with acquiring war machineries, bombing them therefore is justified as they are presumed guilty. Lastly, for the question, who is innocent in islam? These are people who are presumed innocent by the leader though in reality could be indeed guilty of offense. Who are guilty of death? These are people who could be innocent in the real sense of innocence but presumed guilty by the leader. But the fact remains, Muhammad massacre of Banu Quraisha through a Jew’s verdict is absent from the revelation–there is no such that decreed the participation of a jew’s verdict–therefore a major violation as Muhammad should only follow what is revealed but he did not. He did murder. 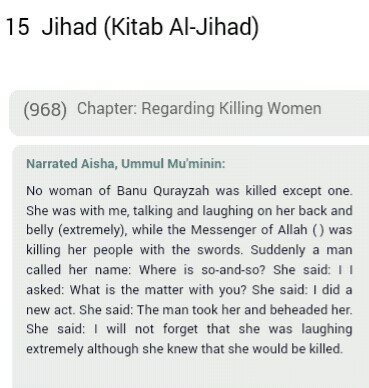 Muhammad killed by his own way and not after the way of Allah. Despite that Allah proclaimed him a model. Therefore, during war, violating Allah by doing murder is good in islam. But Muslims invoke the use of the verse which say, obey Allah and his messenger to claim that Muhammad can make personal decisions. The problem is, Quran is fully detailed thus necessarily, it must have in it the killing of banu quraisha through a Jew’s verdict, but it has none. Therefore it was a lawless order. Logically, murder. Despite that Allah considered it a good thing by upholding the integrity of Muhammad as a model of conduct. Much so, Muhammad cannot invent any order by personal inclination but following only the revelation. So where in the revelation is the order to kill through a Jew’s verdict? None. So what revelation did he follow when he said: I follow nothing except the revelation? None. So obviously, it was murder–appropriately, a massacre. By the star when it descends, your companion [Muhammad] has not strayed, nor has he erred, Nor does he speak from [his own] inclination. It is not but a revelation revealed, taught to him by one intense . Having said that, should you blame us if we thought of that as sort of terrorism? So basically, what is Islam? It is violating Allah in war dealings through murder and kill possibly innocent people by presumption of guilt–such as how Muhammad presumed the guilt of Banu Quraisha teens being unable to determine penal responsibility or mental age.